Got a gala event coming up? Need to add a bit more class to your Halloween costume this year? 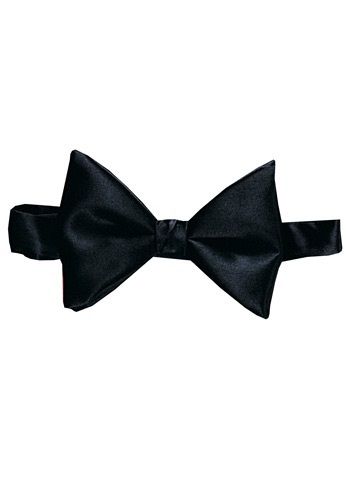 Well, you can't go wrong with a classic Black Satin Bow Tie! Toss it around your neck with a tuxedo or with a Play Boy Bunny costume and you'll be the talk of the party. While everyone else is busy blending in with their regular neckties you'll stand out from the crowd with this nifty accessory. Once you slip it on you'll be as smooth as the satin fabric that makes up this lovely bow tie. A strong and dependable knot will ensure that you never lose a hint of class from a loose bow hanging around your neck. Being adjustable, you can also be positive that you'll never have to deal with even a slight discomfort. So if you're ready to to upgrade your fancy outfit or a classy costume, all you need is this Black Satin Bow Tie and you'll be the best dressed on the scene.